Positive Detroit: Leading Men's Lifestyle Guide Kicks Off Its Detroit Edition! Leading Men's Lifestyle Guide Kicks Off Its Detroit Edition! 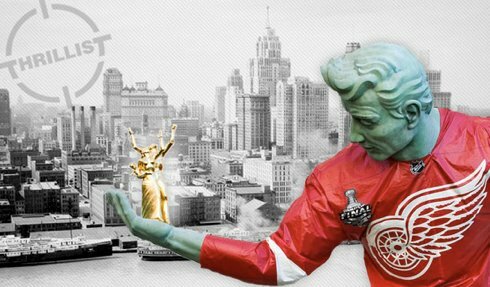 Already reaching over 3 million subscriptions across its 18 US cities, London and best-of-the-web "Thrillist Nation" editions, leading men’s email lifestyle guide, Thrillist, will kick off its Detroit coverage on Thursday, December 1st. Edited by local writer Phil Bator, this free weekly subscription email will arm Detroit’s work-hard-play-hard guys with targeted editorial recommendations that sift through the crap to find the best in food, drinks, services, gadgets, gear, sports and travel in their local market. Thrillist's commitment to cover all that’s new, unknown, or inexcusably under-appreciated has made it a must-read for any self-respecting male. “Detroit is on the rise and we’re really excited that we can be there to publicize and support the chefs artists, entrepreneurs, and innovators who are betting on the city, just as we are,” say co-founders Ben Lerer and Adam Rich. About Phil Bator: Thrillist Detroit's Phil Bator started giving back to his native city as a young child, when the family car was broken into during the Auto Show and their coats stolen by a brick-throwing kid with a good eye for great deals (four jackets!) and high fashion (aqua Starter jacket, youth size small). He went on to attend University of Detroit Jesuit High School, and majored in advertising at Michigan State University without any minors (in possession). Upon graduation, he moved to the suburb of Royal Oak and can often be found conducting "market research" for his role as editor of the popular website Texts From Last Night. His favorite day is Sunday, he bleeds coffee, and he doesn't ever want to hear you singing the Journey song that references growing up in nonexistent "south" Detroit.